NO CODE NEEDED: Junior Fit Basic and Misses Relaxed Fit Basic both $13.97! Ends 8/31/11, 11:59 EST! Get customizing! 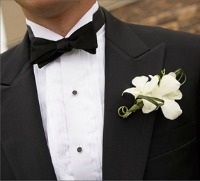 It is an optional tradition for the bride and groom to exchange gifts the night before, or morning of the wedding. Sometimes couples give each other something to wear to the wedding (cuff links or a necklace), or maybe something for the honeymoon such as snorkeling gear, a golf club or a nice pair of sunglasses. It definitely doesn’t have to be anything major–it can be something as simple as exchanging letters the morning of the wedding or a simple frame with your favorite photo! Below we have listed the top ten gift ideas for your groom should you choose to honor this fun tradition! For all other pre-wedding needs check out Bridal Party Tees! We have tees for bachelorette parties, bridal parties, honeymoons, accessories, gifts and favors and more! 10. A Customized T-Shirt for the Bachelor Party: Surprise your groom with customized bachelor party tees for your groom and his friends! 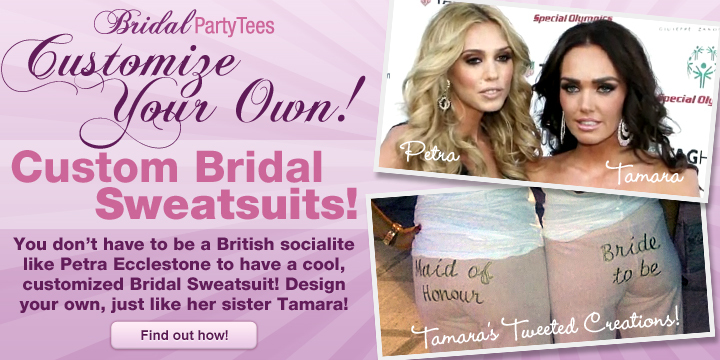 Check out some of our designs on Bridal Party Tees for ideas! 9. Engraved Photo Frame: Choose your favorite photo of the two of you and put it in an engraved photo frame! He can put it on his desk at work or dresser at home! 8. Flask: An engraved flask is a really fun and inexpensive keepsake for your groom! 7. Watch: Buying your groom a watch is a classic gift that he will appreciate. Chances are he just spent mega bucks on your engagement ring so why not help him step up his own jewelry collection with a fancy new watch? 6. Cufflinks: Most tuxedos come with a pair of cheap plastic cufflinks and studs that are hardly befitting of your stylish groom! Help him upgrade with a nice pair that he can wear for years to come! 5. Poker Night: Not everyone can afford a getaway weekend to Las Vegas for some gambling, so surprise your guy with a bottle of his favorite liquor, some music, and a poker set! Invite the boys and you’re done! 4. Fishing gear: Send him on a fishing trip with his boys and send him on his way with some new fishing gear! If he’s not a fisherman, the present could be airplane tickets, football tickets, camping gear, or keys to a rental cabin. 3. Digital camera: There are going to be lots of experiences in the years to come that you both want to capture. Buying him a new digital camera will ensure that these memories get recorded! You can even take it with you on your honeymoon! 2. New iPod or accessory: If your guy loves gadgets and music, an iPod might make for a perfect gift! Does he already have one? Maybe get him an armband case so that he can listen hands-free while he’s at the gym! 1. 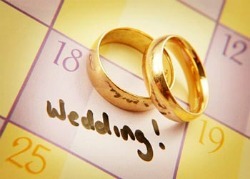 Adventure Sports: Getting married is one of the biggest adventures of your life! If the groom has an interest in adventure sports, capitalize on that and get him a gift certificate for the two of you to do something thrilling! It could be skydiving, white water rafting or rock climbing! NO CODE NEEDED: Junior Fit Ribbed Basic and Misses Relaxed Fit Basic both $13.97! Ends 8/17/11, 11:59 EST! PLAN AHEAD AND BUY NOW! Below we have listed the top 10 most helpful wedding planning tips to get you started on your wedding preparations! For all other pre-wedding needs check out Bridal Party Tees! We have tees for bachelorette parties, bridal parties, honeymoons, accessories, gifts and favors and more! 1. Get a Grip on the Guest List: One of the first and most helpful things you and your fiance can do to start planning is to get a grip on the approximate number of guests you’re inviting. The number of guests will play a huge role in your budgeting, choice of venue, and meal selection. 3. Step by Step: Put together a wedding planning schedule and get things done one-by-one in logical order so you don’t take on too much too soon. Don’t design your cake before you’ve chosen your flowers, don’t hire vendors before you’ve confirmed your date, etc. 4. Keep a Paper Trail: Make sure you get any nonstandard charges to your agreement in writing or send the vendor a confirmation email. Don’t take anyone on their word alone-by the time the wedding rolls around they might not be working for the company anymore. 5. Make a Binder: In a three-ring binder, compile all your correspondences with vendors, notes you make during meetings, and photos or magazine ads you want vendors to see. You can even set up a special email account dedicated to your wedding. 6. Set the Style: The style of a wedding sets the tone for the remainder of the planning and influences the budget, the guest list and all events involved. The merging of differing but coordinating images and items will influence events such as the rehearsal dinner, reception and even showers and bachelor/bachelorette parties. 7. Compromise: Remember that while your wedding is your special day, it’s also your fiance’s special day! 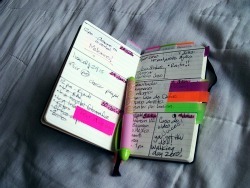 Try to do as much of the planning together as possible. This way you’re both happy (and aware) of the decisions that are being made and it will help you stick to a budget! 8. Have a Stress Reliever: While planning a wedding can be one of the most fun things you’ll ever do, it can also be very stressful, and even cause you and your fiance to fight over petty things. Find an activity that calms you down and relieves stress like going on a bike ride, getting a massage, or hitting the gym. 9. Don’t be Afraid to Ask for Help: It’s not a sign of weakness or incompetence to ask for help when planning your wedding. It can be a huge, daunting task so there is no shame in asking for a little help! Look into hiring a consultant, attend bridal shows, read bridal blogs, or seek help from a close friend you know who enjoys event planning.